This report is a collaboration between the Centre for Intellectual Property Policy & Management (www.cippm.org.uk), Bournemouth University (BU), the Department for Human Resources & Organisational Behaviour, The Business School, BU, and CREATe, the RCUK Centre for Copyright & New Business Models (www.create.ac.uk). The Hargreaves Review stated: “The problem of orphan works – works to which access is effectively barred because the copyright holder cannot be traced – represents the starkest failure of the copyright framework to adapt.” (Digital Opportunity: A Review of Intellectual Property and Growth; London: Intellectual Property Office; 2011; p. 38). This report was commissioned by the Intellectual Property Office to support the implementation of the Hargreaves Review. It aims to offer a clearer understanding of how orphan works are regulated and priced in other jurisdictions, and how a pricing system could be structured to ensure that “parents” are fairly remunerated if they re-appear, and users are incentivised to access and exploit registered orphan works. ‘Orphan works’ are works in which copyright still subsists, but where the rightholder, whether it be the creator of the work or successor in title, cannot be located. This report was commissioned to assist the UK government in evaluating policy options in the implementation of the Hargreaves Review of Intellectual Property & Growth (2011) to enable and price the use of orphan works. The research proceeded in two stages. Study I undertook a comparative international review of actual or proposed orphan works legislation, and identified key characteristics of orphan works licensing schemes. Study II investigated the potential effects of such schemes by conducting a simulated rights clearance exercise for six scenarios (establishing licence terms and fees for specific commercial and non-commercial uses), and analysing the resulting dataset for effects of the characteristics identified in Study I. The comparative review relied on a close scrutiny of actual or proposed legislation and considered government reports, draft bills, publications and other commentaries on the orphan works issue. The countries reviewed included jurisdictions with operational orphan works regulations: Canada, Denmark, Hungary, India, and Japan; as well as provisions at the EU level and in the US (draft legislation and current practice). The purpose of the review was to identify key features of legal regimes with respect to factors such as – (i) categories of works covered; (ii) standards of diligent search; (iii) the mechanism for obtaining permission; (iv) the existence of a register or database of recording suspected orphan works; (v) the role of collecting societies;(vi) tariffs set by category of work; (vii) mechanisms for challenging tariffs; (viii) remedies for reappearing authors and case law, if any, on damages for infringing use. (1) Two distinct approaches appear to be used for governing orphan works in the jurisdictions reviewed. The first may be labelled ‘ex-ante’, and involves rights clearing before a work is used, the second is ‘ex-post’ and typically involves the management of infringement risks by the user. In the former an applicant is required to engage with an authorising body or collecting society in order to receive a licence to make use of an orphan work. In contrast, the latter involves either the creation of a statutory copyright exception, or a limitation of liability where an applicant makes use of an orphan work after having exerted some effort to identify the potential rightholder (e.g. diligent search, attribution). These regimes provide different levels of protection for authors and users. The ex-ante approach is exemplified by Canada, Japan and India where a potential user has to discuss terms with a copyright board. In ex-post systems payment is only due in case an author reappears. This approach is exemplified by the US. The analysis shows a strong protection for rightholders, both ex ante and ex post, in India, and Japan; and a relatively lower protection in the US, and to a certain extent Denmark (under the system of Extended Collective Licensing). Canada and Hungary are intermediate cases (e.g. no advertising requirements prior to use, but public listing of granted licences). (2) While most jurisdictions require a diligent search to be conducted by the applicant there is no uniform standard constituting a diligent search. Across jurisdictions the specifications for diligent search vary considerably. Requirements involving the preventive search of the author range from the weak provisions of Denmark (no search required), Canada (requiring “reasonable effort”), and the US (“reasonable search” required) to the strong provisions of India, Japan, Hungary and the EU (but not France) providing a duty for the user of performing a “diligent search” or “due diligence search” (India) accompanied by some form of record tracking of the steps performed. The EU lists minimum sources for a diligent search in the Annex to the Orphan Works Directive. Advertising requirements (in the national press or equivalent) are provided in Japan and India. (3) The United States had proposed a “limited liability” approach, under which the use of orphan works is possible after a reasonable search. In the case of an infringement claim orphan users are liable only for a reasonable compensation. Denmark uses an Extended Collective Licensing system, which involves collective negotiation with users (normally for multiple licensing) valid also for non-represented authors. In turn, the EU leaves Member States free to choose their regulatory approach (for example, France has chosen a central licensing system in its forthcoming legislation). All the other countries reviewed implement the central licensing system, with a central public authority granting copyright licences on orphan works. (4) Prices are set by central authorities in the countries that have a central licensing system, and by collecting societies in Denmark. Interestingly, national central authorities have claimed that although no official negotiation process is provided by law, the price of licences is set on a case by case basis, after considering the individual circumstances of the applicant. Set prices can be challenged mostly in an ordinary court of law in the examined countries, or alternatively before the licensing authority with a quasi-judicial procedure (e.g. Canada). Infringement claims are handled by ordinary courts in all countries (including the US) or by licensing authorities with quasi-judicial procedures (in Hungary). In Denmark, both prices and infringement claims are under the jurisdiction of a special tribunal (the Copyright Licensing Tribunal). The above rules on price, infringement, and legal remedies do not derive from EU law, which leaves these matters to Member States. (5) In Canada, Japan, India, Denmark and France an upfront payment is normally required byte applicant in exchange for using orphan works. In Canada, payment is upfront in approximately two-thirds of cases, whilst it is contingent on the rightholder reappearing in the remaining third. See De Beer and Bouchard (2010). In Hungary the amount is identified but may not be deposited (for non-profit licensees). It will be paid directly to the rightholder, in the event that he or she reappears. In the US, no payment is made until a court decision is issued, following an infringement claim. Particular roles are envisaged for collecting societies in Denmark, in which they handle the whole system, Hungary, where collecting societies retain unclaimed revenues after five years from expiry of licence, and Canada, where collecting societies are consulted during tariff setting, and hold collected fees (to be used as they see fit). (6) In the US, in Hungary, and France a voluntary public online register for suspected orphan works is established. The EU is establishing a register at the Office for Harmonization in the Internal Market (OHIM). In Japan, some institutions have their own register of orphan works. No register is envisaged in India, Canada or Denmark (prior to the Orphan Works Directive). However details of all licences granted are available on-line in Canada. The “Rights Clearance Exercise” reported in Study II is a combination of various methods. In a first step a simulation approach is employed to collect a unique dataset on actual or potential licence fees for orphan works. Representatives of rights clearance authorities from countries covered in the comparative legal review (Canada, Denmark, France, Hungary, India, Japan, supplemented by some US data) were asked to provide a licence fee for each of six scenarios that are likely to occur in reality (from creating a small online resource to mass digitisation projects). Two rates for each scenario were sought, for commercial and non-commercial use. In a second step the dataset is subjected to various analytical techniques, including a regression approach and a comparison of collective licensing systems against others through the computation of effect sizes. (1) There does not appear to be a standard price for licensing orphan works. In fact tariffs vary widely. For example, to clear 50 items from a folk tune archive for commercial use will cost the equivalent of £188 per year in Canada, and (under reasonable assumptions) £9,312 per year in France. In fact, the only consistent finding appears to be that in almost all cases commercial licence fees tend to exceed non-commercial ones. (2) Licences were not available for all scenarios. Re-issuing orphaned broadcasts seems particularly problematic, with no licence offered in any of the countries investigated. (3) There is no systematic recognition of what may constitute an appropriate duration for licences. Licences were very variable from country to country, ranging from a monthly to a five-year licence, without the provision of a permanent licence. (4) We find high tariffs that discourage mass digitisation projects. Per item fees initially appearing very low and thus sustainable turn out to render mass-digitisation unviable for public and non-profit institutions when scaled up under reasonable assumptions. Mass digitisation projects involving 100,000 items may incur annual licensing fees exceeding £1 million per year. (5) The average level of fees imposed on a potential user of an orphan work is similar in collective and individual licensing regimes. This is an interesting finding because it mitigates arguments that one of the regimes will lead to higher fees. The operating costs involved in running an orphan works scheme appear therefore an important factor when choosing between individual and collective approaches. (6) A limited liability system seems to have advantages for archives and other non-profit institutions exposed to orphan works, enabling those organisations to share their stock of orphaned artefacts with the public. In contrast, the up-front rights clearing seems to provide more appropriate incentives for commercial uses of orphaned artefacts, guaranteeing that a reappearing rightholder will be compensated for the exploitation of any work. Together, the findings from both studies indicate the need for a more structured and consistent approach in governing orphan works that is reflected in the pricing and duration of licences, and in the costs of running any licensing system. 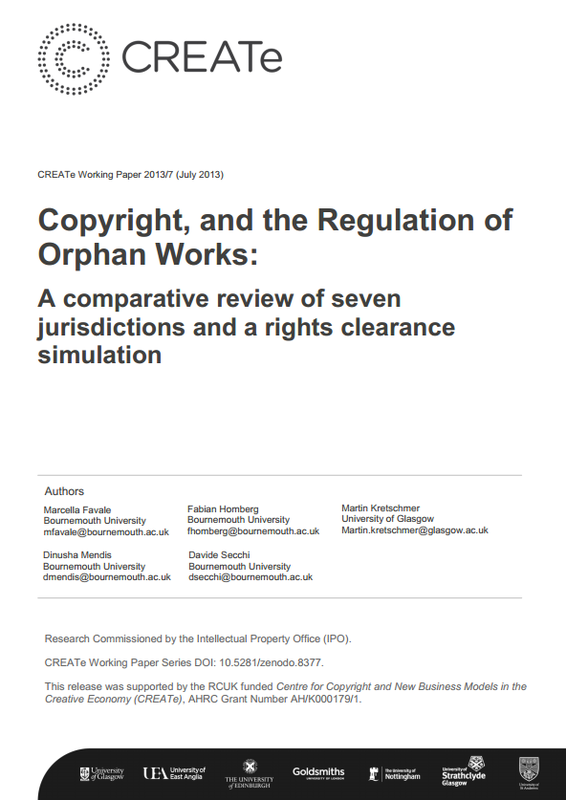 Download Copyright, and the Regulation of Orphan Works: A comparative review of seven jurisdictions and a rights clearance simulation.